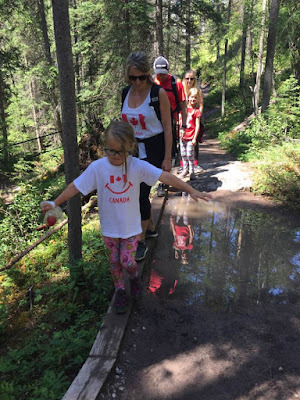 On Canada Day, we hiked Maligne Canyon and severely overdressed for it. We were all hot but in our defence, we had a crazy storm at our campground and the forecast called for more rain so we all went safe. 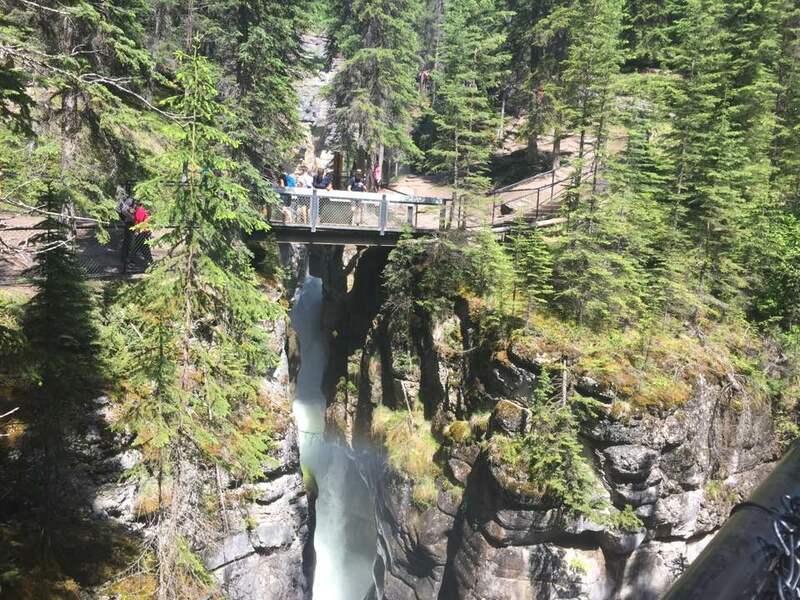 There are 3 places you can start Maligne Canyon from: Sixth Bridge, Fifth Bridge and from the top. Sixth to Fifth is as long as Fifth Bridge to the top and a lot more difficult. A lot of people start at the top and only go down to the third bridge and then back to the top. We started at Sixth Bridge this time round. The first time I hiked Maligne Canyon, I was 8 months pregnant with Penelope and was so mad at Greg because I thought it was so hard that I made him hike back alone to get our car and drive around to pick up me, my sister and Finley. This time it went way better but I remembered why hiking it so far along was a bad idea. 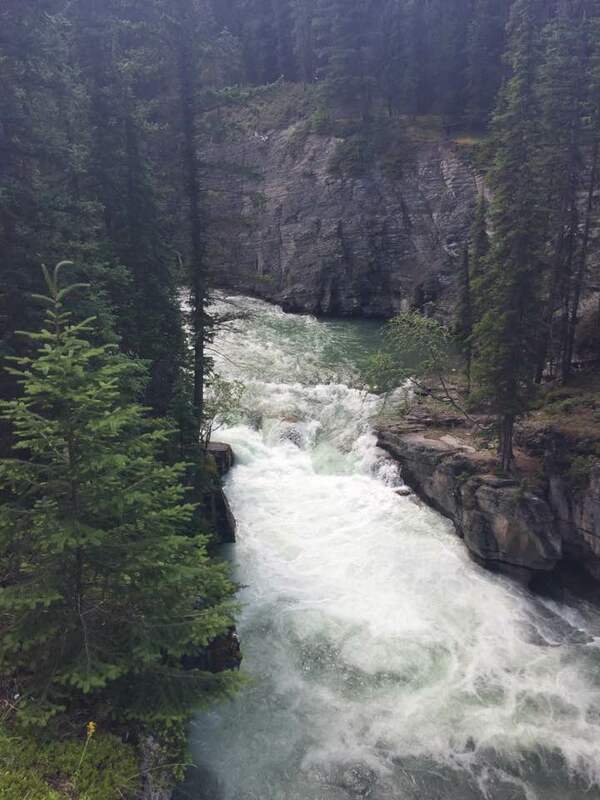 He likened it to Johnson Canyon lower falls but it is nothing like that hike. One of the best things about camping with my cousin and his family and by that, I mean Nancy is that we get at least one family photo every trip. I love it!! 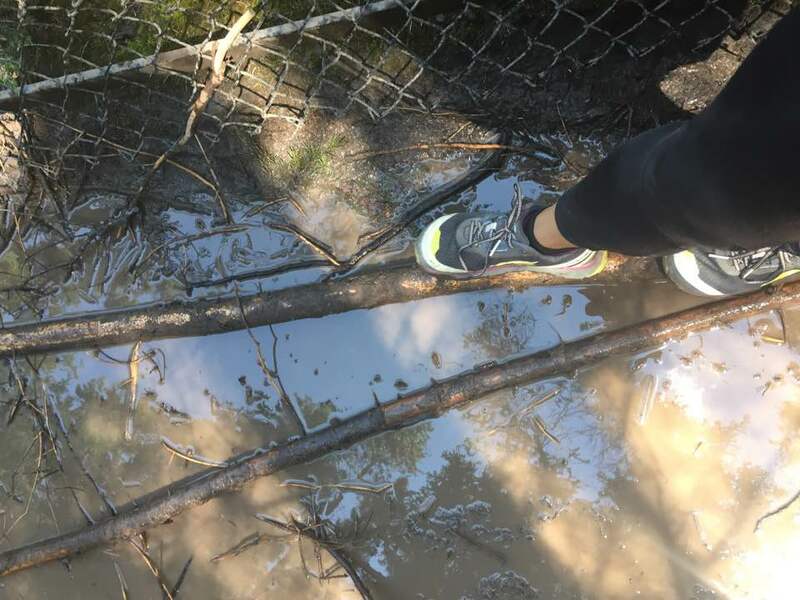 The trail from sixth bridge to fifth bridge had some tricky spots so Greg had to help the girls get across. 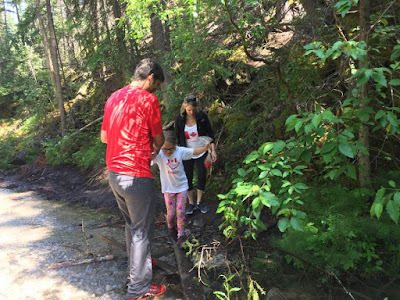 But would it be a hike if not for some of these areas?? There are no bathrooms at the start of the Sixth Bridge so we had to get off the trail and cross the Fifth Bridge to get to the bathrooms there. They only have outhouses and one was closed. 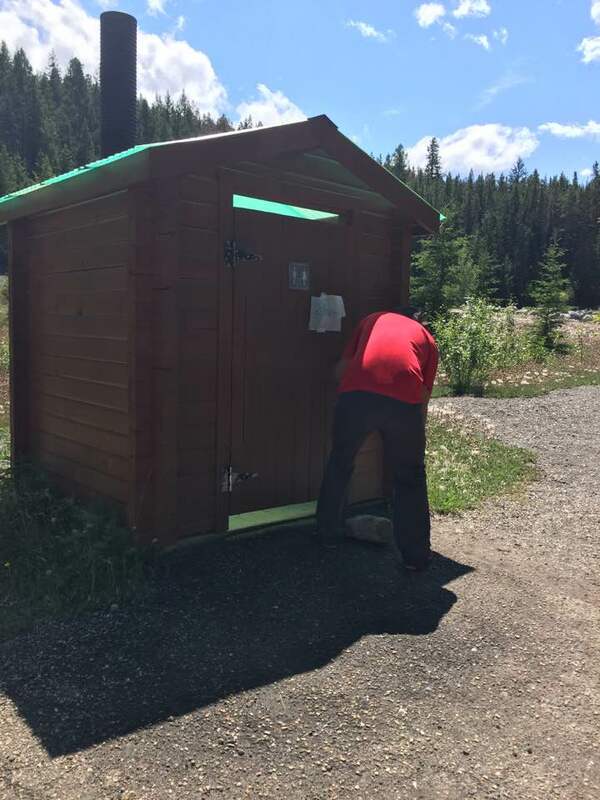 While we waited in line to use the one that was still open, Greg was curious as to why a outhouse would be closed other then it was full. So he pulled off the rock and went in and looked and found a duck in the bottom of the toilet nesting. He told everybody and I think most thought he was joking but he was true. 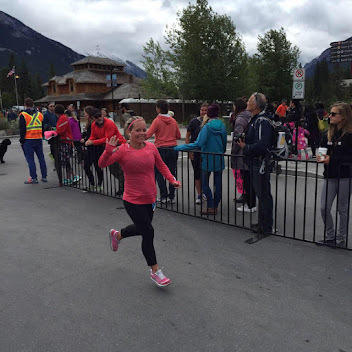 I didn't look as I have a bad experience from accidentally looking into one at the Calgary Marathon in 2015 and it was not a good thing. Finley looked into it but Penelope chose not to. It got a little tough uphill but it wasn't too bad just really hot since we weren't blocked at all from the sun or the heat. Finally we got into the rushing water and the canyons. Some people love mountains, but me, I love me some canyons. 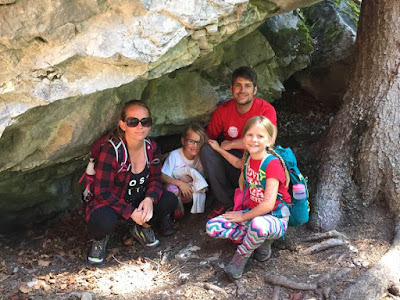 I have never been on a canyon hike I didn't love . There is just something about them that make me all happy. Trying to get a good 150th Canada birthday photo but Penelope was of course being a goofball but at least the backdrop was great. Penelope's balancing act. For the record, she didn't really need to balance quite like that and really made it go slow but she thought it was necessary and she is pretty cute so how could you push her?? Her main priority was falling into the mud because she almost always does that intentionally, but she didn't want to drop her swedish berries. 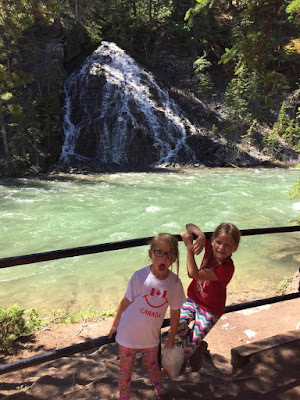 We tried to get as close to the gushing water as we could because we were so hot and the splashing felt so good in the heat. It was crazy to see how high we were at some points and again the cool air coming up from these canyon splits was fantastic. Some of the views were so amazing in person but almost impossible to translate it via iPhone photos. 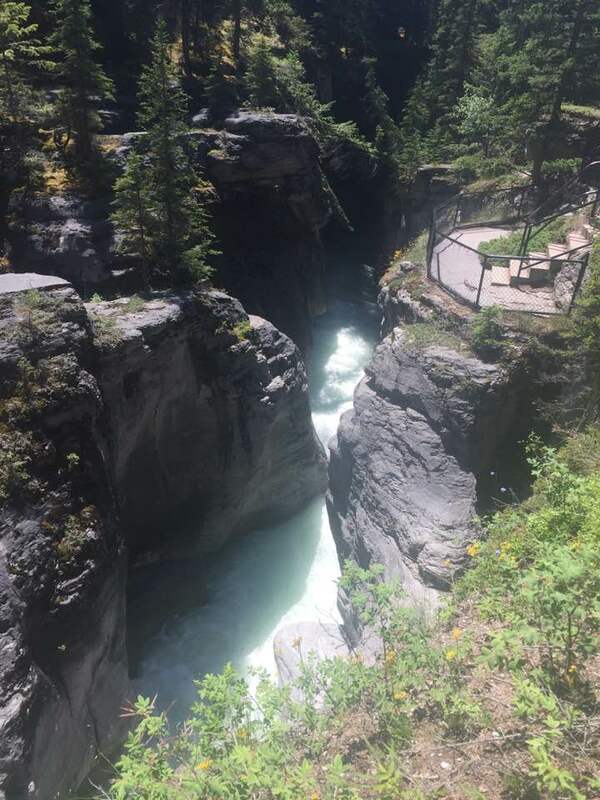 I believe I read somewhere that the canyon measures nearly 160 feet deep so it is huge. It is one of the deepest found in the Canadian Rockies. This is made more tricky by the fact that I am carrying my iPhone and I am trying to take a photo and also trying not to drop it or get muddy. 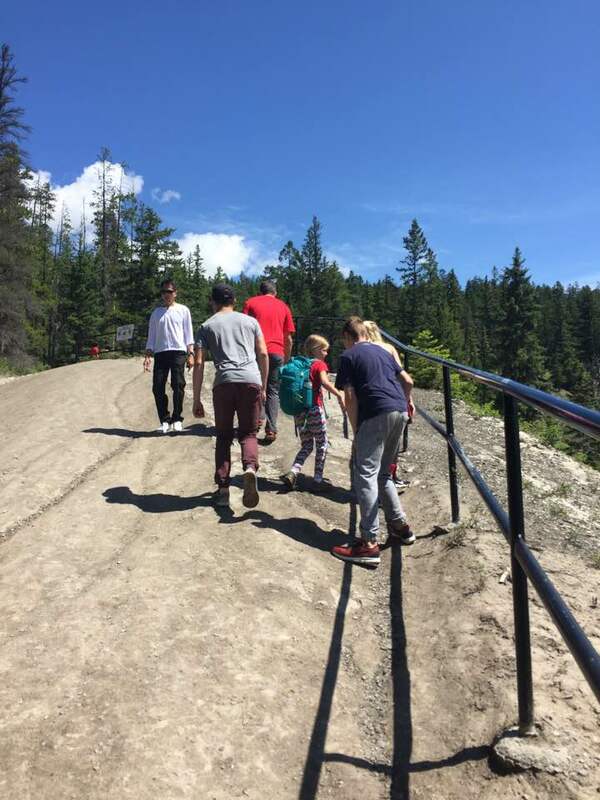 It was around this point that me, Penelope, Jimmy, Nancy and tanner got separated from Greg, Finley, Madi + Kale. Apparently there were 2 ways we could go - the cool way with awesome view points and the hard way that was steep and dirty and hot and we chose the uncool way. 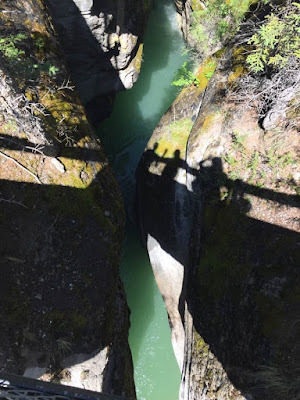 We even stopped to wait for them and then noticed them down below and were annoyed that we missed some cool view points and went the hard hot way. 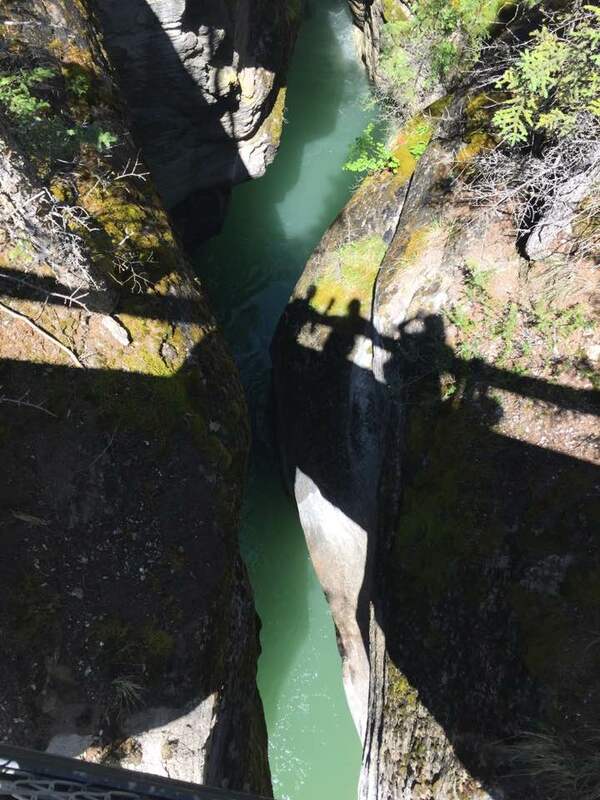 We made sure to go the right way back down. 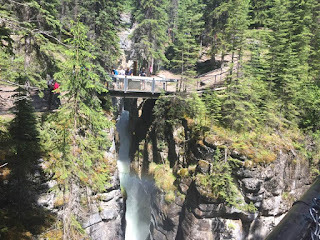 The canyons of Maligne Canyon show the characteristic of Karst topography and is common around here because of its easily soluble nature. 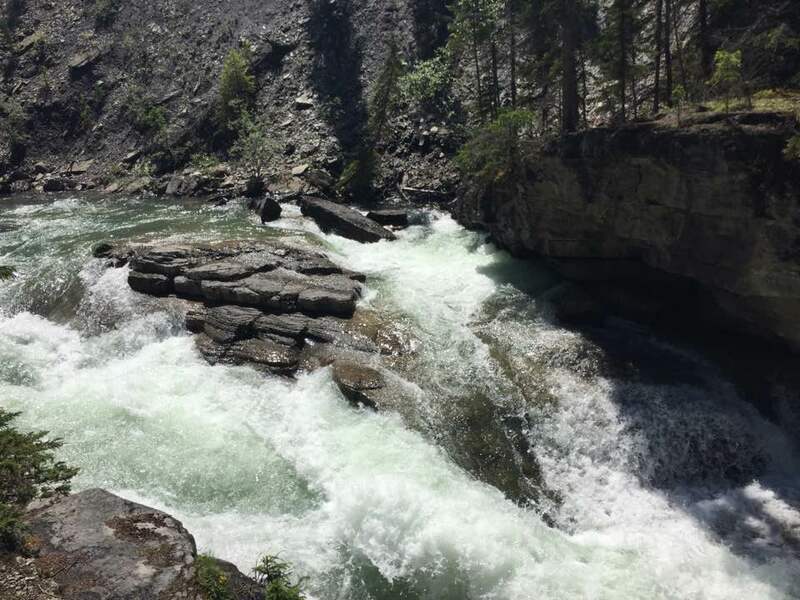 The maligne river flows in from Medicine Lake which surprised me since I thought it was part of Maligne Lake Limestone is one of the most dominant minerals within the canyon. It has become deposited in a shallow tropical sea by plankton which secrete limestone. When we got to the top, we walked to the restaurant/gallery building where we all cooled off with some sort of ice cream or slushy drink. It was delicious given how hot we all were. You can see from this photo on our way back down how high we were at some points and the water below it. I think this might be one of my most favourite photos that I took on this hike. Maligne Canyon is a really easy hike whether you start from the sixth bridge or the fifth bridge. 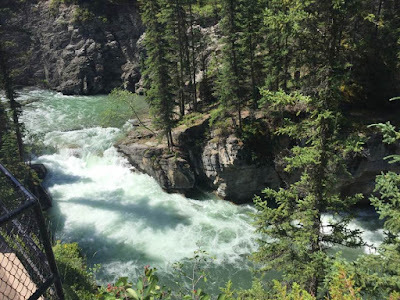 It is located about 10km from Jasper and has large parking lots at both fifth and sixth bridge and an even larger one at the top. I would avoid parking at the top if you are looking to do the full hike because it is crazy busy with those only wanting to hike to the view points near the top. 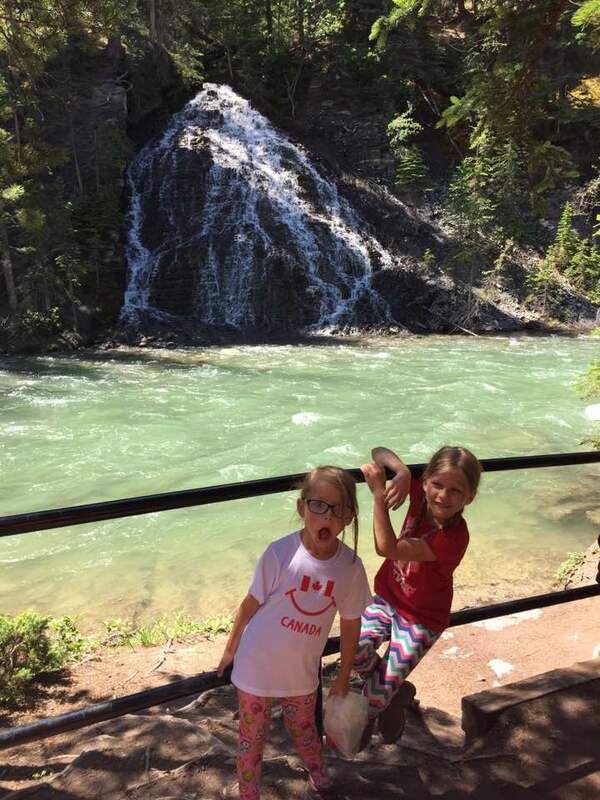 My Apple iWatch showed that we hiked just under 9km in around 3 hours but that included the ice cream stop as I never stopped it when we went in. 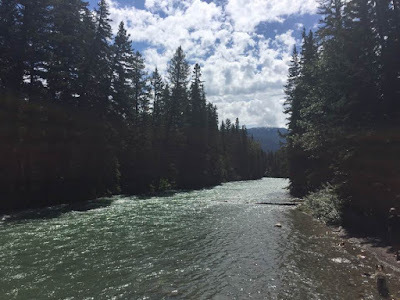 I highly recommend that you do this hike if you are ever in Jasper and all parking lots sport several picnic tables for lunch before or after your hike.